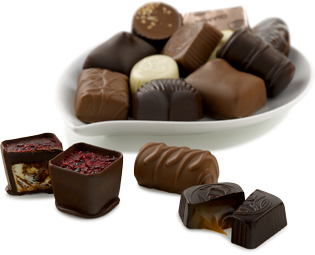 Here at The Gourmet Chocolate of the Month Club™ we are constantly searching the globe for new gourmet chocolates and chocolatiers for our members. This month we bring you a new addition to our chocolate family that is based right here in the good ol’ United States in Los Angeles, CA: Droga Chocolates. Meaning ‘drug’ in Italian, Droga Chocolates has followed these core values since its start in 2007: the best taste, the highest quality, and the most fun. We couldn’t agree more. What started as a hobby is now an award winning confectionary that takes your everyday confections and gives them a modern twist. Founder and president, Michelle Crochet, will always admit to one addiction she has had her entire life: her mom’s take on the classic rocky road candy. When Michelle’s mom was pregnant with her, she took the classic rocky road recipe using simple everyday ingredients from the store and swapped out the traditional walnuts with salted roasted peanuts and instantly had a hit on her hands. Fast forward a few years to when Michelle was all grown up, and the San Francisco native started to develop a love for great food that deepened when she moved to Italy where she learned how simple and fresh ingredients can create something truly magnificent. With that love and passion she even became a food buyer for the national luxury kitchen retailer, Williams-Sonoma. While working there, she was able to travel the world searching for the best products to sell, which helped her learn about food, the ingredients, the taste, texture, quality, and flavor. Even though she loved her job, she realized that she wanted to work for herself. According to her, one day while she was driving around looking for parking in San Francisco, she was thinking what she could sell and the only thing that she could think of was her mom’s rocky road. The candy was already a hit with her friends and family and she knew she could make them even better by upgrading the everyday ingredients with fresh, high quality ingredients – the same principles that she learned when she lived in Italy just a few years earlier. On a Saturday afternoon, she spent the day in her kitchen to begin making test candies, and when she found the perfect combination of ingredients, she christened them Rebel Rocky Roads. Soon she was driving to gourmet retailers across the San Francisco Bay Area to introduce her candies, and most of the time they would place an order right then and there. At this time her candy making was just a hobby as she still had a great career with Williams-Sonoma. However, that all changed when San Francisco Magazine got a hold of her Rocky Rebel Roads and did a full page write up. Within months, her hobby was turning into much more than just a Saturday gig, so she began thinking about other candies and confections that she could make to accompany her newly popular Rebel Rocky Roads. Michelle wanted to try to make something with her other love, caramel, and on her weekly outing to the farmer’s market, she began noticing that there were several vendors who were selling unrefined honey. Taking honey with her, Michelle got to work in her kitchen and before she knew it she had another winner on hands which she named Money on Honey. To this day it remains her best seller, and you have some in your shipment today! Knowing that this could be the career change she was hoping for, she drew up a business plan and convinced her parents to invest – and boy we are so glad they did because soon after, Michelle had packed her bags and headed down to sunny Los Angeles, CA to start making confections full-time. She found some space downtown with equipment from the 1920s and got to work with her new business partner, Lisa Albani, who joined her in 2012 and helped take over the business side of things so Michelle could continue to focus on the creative side. Once settled, she was once again on the hunt for the best ingredients she could find for her confections and for her growing imagination. Taking what she learned from her job as a food buyer, she knew only the freshest and purest ingredients will work for her candies. Her rule of thumb? Only use ingredients that taste delicious by themselves with no additions. 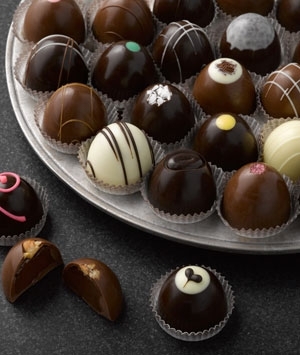 The first step in making perfect candies is having the perfect chocolate, and what better than Guittard chocolate to enrobe all her confections? Guittard is a bean to bar company from the San Francisco Bay Area in Northern California that has been family operated and owned since its start in 1868! With that kind of history, we can bet that they know something about quality! As other confections made their way into the line-up, so did new and, when possible, local ingredients. For instance, all her caramels are made from unrefined wildflower honey from Bennett’s Honey Farm, a green and kosher certified company located in Ventura County, CA, and brown rice syrup that is sustainably harvested from Lundberg Farms in the Sacramento Valley, CA. Even when she can’t use locally sourced ingredients, Michelle will continue to use only the best and all natural ingredients, such as Fleur de Sel salt, which is widely considered the best sea salt in the world from off the coast of Brittany, France. Once the ingredients are perfected, they head to the factory where, even though they have help from some equipment from the 1920s, all the candies and confections are ultimately handmade in small batches, with most of the candies being crafted into one or two bite size pieces instead of one big piece that is later cut up. Money On Honey: Droga’s number one seller! Wildflower honey caramels in dark chocolate sprinkled with Fleur de Sel. Hello Espresso: Double Chocolate Espresso Salted Caramels in Dark Chocolate Topped with Black Hawaiian Sea Salt. Nutty Puddles : Honey Caramel Puddles With Roasted Almonds in Dark Chocolate. Peanut Butter Bots : Peanut Butter Bonbons With Crisped Rice Crunch in Dark Chocolate. All the chocolates and confections in your shipment are Kosher certified by the Orthodox Union and are all handmade in small batches with 100% all natural ingredients. To see other confections and learn more about Droga Chocolates, visit: www.DrogaChocolates.com and to see a short video about them, go to: www.soc.att.com/1wf5K6S.